The Kuari Pass winter trek is one of the most gorgeous treks in the Himalayas, and is suitable for fit beginners looking for a bit of a challenge. In the winter months, the upper parts of the trail are buried in snow. This 6-day snow trek to Kuari Pass gets more challenging as you go along, and you'll end with a couple of days of steep climbing. The fourth day of the trek is one of the toughest, when you'll climb a steep slope through oak and rhododendron forests to get to Khulara camp. This is at an elevation of 11,122 feet and is one of the most picturesque campsites. If you're lucky, you might even see a Himalayan Bear or a snow leopard. 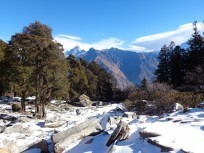 This trek offers you a combination of spectacular locations and the thrill of trekking in the winter. Thanks to the height gain, you can expect to see views that few other treks can offer: rose-gold dawn skies in the mountains, untouched pine and oak forests covered in snow, and iconic peaks like Nanda Devi, Dronagiri, Neelkanth, Chaukhambha and more. • Experience the thrill of a winter trek in the grand Himalayas. • Conquer a high mountain pass to get to Kuari top. • Spend days in the mountains to see all the different colours of winter. • Camp in snowy meadows at picturesque campsites. • Soak in the views of Himalayan giants like Nanda Devi, Neelkanth and Chaukhambha. 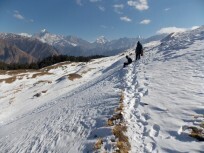 Participants must adhere to the instructions of the trip leader/guide at all times during the snow trek to Kuari Pass. Consumption of alcoholic beverages/drugs during the snow trek to Kuari Pass is not permitted. For any cancellations made 24 days or more prior to the departure of the Kuari Pass snow trek: 95% of the total trip cost will be refunded minus any transaction charges, or you can use this amount to book any other trek with the same operator within a year. For cancellations made between 14-24 days before the departure of the Kuari Pass snow trek: 70% of the total trip cost will be refunded minus any transaction charges, or you can use this amount to book the same trek with any other batch of the same operator within a year. For any cancellations made between 10-14 days before the departure of the Kuari Pass snow trek: 50% of the total trip cost will be refunded minus any transaction charges, or you can use this amount for the same trek in the same season. For cancellations made less than 10 days before the departure of the Kuari Pass snow trek: No refund but you can transfer the same trek to a friend. In case of transferring the snow trek to Kuari Pass trek to a friend, he/she should satisfy all the mandatory requirements put forward by the operator. The operator reserves the right to change/cancel the plans for the snow trek to Kuari Pass without prior notice if deemed necessary. No arguments or refunds will be entertained. Any event cost for the snow trek to Kuari Pass is exclusive of any kind of insurances or medical coverage/benefits. Make sure you report to Haridwar Railway Station on time, as you'll need to hit the road early. Your operator will be waiting for you at 06:30 hrs. You'll be driven to Joshimath, which is a long, scenic drive that goes the gorgeous river confluences at Devprayag and Rudraprayag. You'll get to Joshimath in time for tea. Once you've settled in, you'll be can relax for a while. At night, you'll briefed about the trek, and then a hot dinner will be served. Overnight at a guesthouse. You'll have a short drive of about 12 kms to the Dhak village, the start point of the trek. After this, the fun begins. You'll trek though oak and rhododendron forests on an easy trail. It's not a long trek today, just enough to get you warmed up. You’ll pass tiny hamlets such as Tugasi and Gulling before ascending to your campsite at lower Chitrakantha just in time for a delicious lunch. You'll be camping on a big meadow in tents tonight. Today is quite a challenging climb. You'll go from 9600 feet to 11,100 feet, trekking on steep slopes covered with oak and walnut trees. 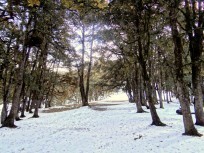 The oak and rhododendron forests are now cloaked in snow appearing to be as though out of a fairy tale. It is a steep ascend to Tali Lake and you’ll be camping further ahead in the midst of a forest. You are surrounded with spectacular views of the magnificent Himalayas and you can spot the Nanda Devi, Chaukhambha and Hathi-Gori peaks. Overnight stay in tents at Tali top. Day 4 of the Kuari Pass trek: Kuari Pass day! Today will be your toughest trekking day, but it's going to be epic! You'll have to negotiating steep climbs to the pass, but you begin with a moderate ascent to Khullara top. The views are already spectacular from here, and you'll only be more astonished as you go higher. The winds are strong from this point onwards, but as you climb to the top of Kuari Pass, the impressive views of the peaks will reward you. You’ll have plenty of time to explore before returning to your campsite at Tali top. Overnight stay in tents. Today you'll begin your descent to Joshimath. It's a long way, but it's all downhill, and you can expect to get some pretty good views. You’ll trek to the rolling Gurson meadows and into Auli. You'll also feel more energetic as you leave behind the thin air of 11,000 feet and descend to the more comfortable altitude of 6000 feet. You'll be driven to your guesthouse to Joshimath where a hot cup of tea awaits you. Overnight stay in guesthouse. Today is an easy, long drive back to Haridwar, where you can rest your legs, admire the views, or catch up on some sleep. You'll be dropped off at Haridwar by around 19:00 hrs. It's advisable to book any onward journey for the next day, in case of delays on this drive. Trip ends in Haridwar. Hard luggage like trolley bags, suitcases, etc. For your first night of camping on this Kuari Pass trek, you'll be camping on a meadow surrounded by pine trees and mountain views. You'll be sleeping in triple-sharing tents, and will be provided with sleeping bags and camping mattresses. Your campsite also has a kitchen and dining tent where you will enjoy delicious meals and a toilet tent. | Your meals for today include breakfast, lunch and dinner. You'll camp in the midst of a forest at an altitude of 11,070 feet. You'll be sleeping in triple-sharing tents, and will be provided with sleeping bags and camping mats. Your campsite also has a kitchen and dining tent where you will enjoy delicious meals and a toilet tent. | Your meals for today include breakfast, packed lunch and dinner. You'll return to camp tonight, exhausted from an arduous trek but delighted and victorious. Youâ€™ll sleep like a baby in triple sharing tents and will be provided with sleeping bags and camping mats. Your campsite also has a kitchen and dining tent where you will enjoy delicious meals and a toilet tent. | Your meals for today include breakfast, packed lunch and dinner. Today is a long drive back to Haridwar. You'll be provided with breakfast today, but the rest of your meals during the drive will be yours to choose and pay for. The trip ends in Haridwar by about 19:00 hours. The operator will arrange your transport to the start point of the Kuari Pass snow trek.